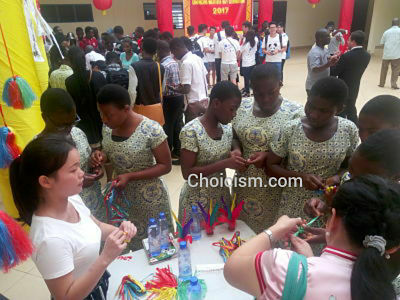 The Confucius Institute (CI) at the University of Cape Coast (UCC) has observed the 2017 Confucius Institute Day Celebration with a colourful display of Chinese culture. The Confucius Day Celebration is a programme organized annually to commemorate the birthday of the Chinese Philosopher, Confucius whose philosophies and wisdom are acknowledged as being the bedrock of China’s handbook of governance and its code of personal morality for thousands of years. Addressing the gathering, the Country Director of the Confucius Institute, UCC, Professor Ishmael Mensah acknowledged Confucius, a man upon which the Institute was modelled, as an experienced man who represented the Chinese culture. This, he says, makes it imperative for Confucius to is be celebrated. “Confucius was a sage, a very learned man, he was a teacher, and he epitomized the Chinese culture and therefore it is not out of place if today we decide to use his day to promote the Chinese culture. In fact, he has earned a number of accolades as a result of his influence on Chinese culture, philosophy, and even politics,” he said. Prof. Mensah added that the Institute is charged with the responsibility to ensure a cross-cultural relationship between Ghana and China by promoting the Chinese culture. “We at the Confucius Institute, at the University of Cape Coast, are using today to showcase the Chinese culture because that is our mandate. Our mandate is to promote the Chinese language and culture so that we can foster cross-cultural collaboration between the people of Ghana and the people of China, ” Prof. Mensah stated. He also encouraged the Chinese representatives in Ghana to take the opportunity to also learn the Ghanaian culture so that they would be worthy ambassadors to Ghana when they return back home. The China Director of the Confucius Institute, Professor Hu Liangcai in a speech, disclosed that there are some opportunities available to students and lecturers who are associated with the Institute. He thus advised that students take the opportunity to study the Chinese culture. This year’s celebration which was dubbed, “Getting Close to Confucius Institute: Experiencing Chinese Culture,” provided a platform for the audience to be taken through some Chinese arts upon which Confucius’ philosophy of education were built, Calligraphy – the traditional art of writing the Chinese characters; Jianzi – a traditional Chinese national sport; Chinese paintings amongst others. The programme was attended by some students and lecturers of UCC and students of the University Practice Senior High School.